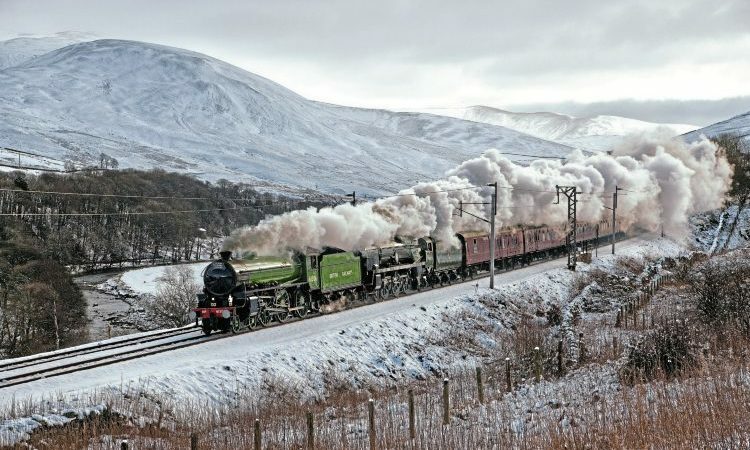 In his latest column, Don Benn describes the performance of Clan Line on December 20’s ‘Carols in Sherborne Abbey’ trip – and also February 2’s ‘Winter Cumbrian Mountain Express’ double-header of Mayflower and British India Line, which hauled the train between Carnforth and Carlisle and return to Preston via the Settle and Carlisle route. THIS time I am reporting on more good work by No. 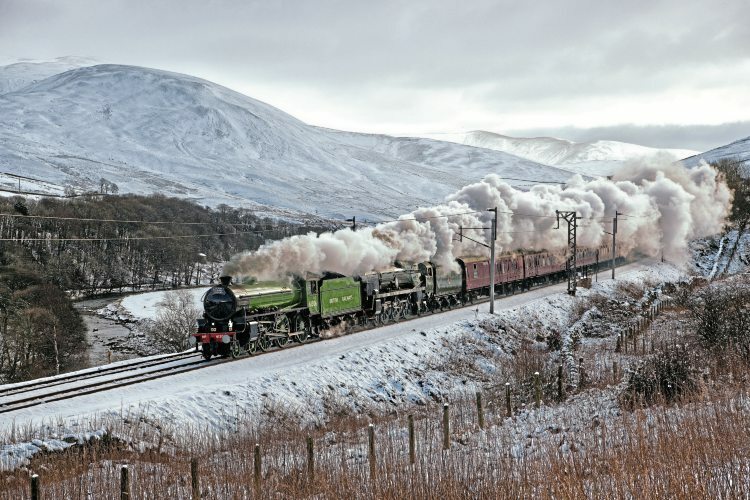 35028 Clan Line and also on the return to the main line by No. 61306 Mayflower. First however, a correction – in the last issue, I stated that the equivalent drawbar horsepower (EDBH) figure for Clan Line on November 24 was 1470. This figure was an error as the middle two figures were transposed and it should have been 1740 which although high still wasn’t anywhere near the exceptional value of 2160 on December 8. On December 20, No. 35028 was in action again, this time on home tracks with the UK Railtours’ 8.46am Victoria to Sherborne ‘Carols in Sherborne Abbey’ trip. Originally this was planned to have a very early start and an unacceptably late finish so I hadn’t intended to participate. However, the final times were much more civilised and I decided to join the train at Clapham Junction where it was booked to pick up at 9.04am. It was a bright, cold morning and I was encouraged to see steam appear in the distance over the tracks near to Longhedge Junction as the charter was on time at that point. However, once again train operator SWR was having problems and the signallers decided to hold the train there while a succession of late-running up Windsor line trains were given precedence. Unfortunately, this meant that the Sherborne train had lost its path which had repercussions right through to Salisbury, compounded by further dubious operating decisions. For the initial section to Staines, Clan Line had Jim Clarke on the regulator with Tim Stedman firing and traction inspector Don Clarke keeping an eye on things. The load was once again a substantial one of 12 coaches, 429 tons tare and 460 tons full. I settled down with other exiles from the days of steam as we departed 13 minutes late and then got checked by signals most of the way to Staines, leaving there no less than 25 minutes late for the nominally nonstop stint to Salisbury, though it proved to be anything but. Driver Wayne Thompson was now in charge, but the checks continued and we stopped outside Woking nearly half an hour late.